Ettore Recchi, Head of doctoral studies in Sociology, Full Professor at Sciences Po presents the new master's programme in Sociology. 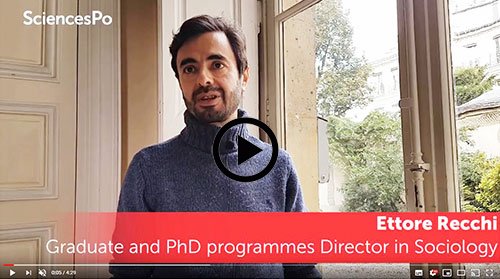 Read also Ettore's interview: "A Phd is a life choice"
At Sciences Po, sociology is a problem-driven, theory-oriented and method-based discipline. Our two-year Master training is premised on the social relevance of research issues, a solid foundation in classical and contemporary social theory, and up-to-date analytical skills in both quantitative and qualitative techniques. From very early on, students are also required to engage in hands-on empirical research, through ethnographies, interviews, surveys, and exploration of large datasets. A huge emphasis is placed on the final dissertation (mémoire), which is expected to stem from students’ original fieldwork and/or data-based investigations of high academic standard. Subjects vary and reflect the wide spectrum of interests of the almost 50 researchers of the Sociology Department at Sciences Po. Classes are taught in English and French. Students are entitled to use both languages in exams, papers and the final dissertation. To facilitate the integration of non-French speaking students, first year courses are prevailingly taught in English. Holders of the Master Recherche in Sociology from Sciences Po are particularly well suited to pursue academic careers through PhD programs, join policy-making organizations and public institutions, and work for research institutes on a national and international scale. Organization of courses 2019-2020 - NEW! The teaching staff made up of internationally recognized sociologists. While teaching benefits from outside Sciences Po, the core of the teaching team comes primarily from Sciences Po research centers.